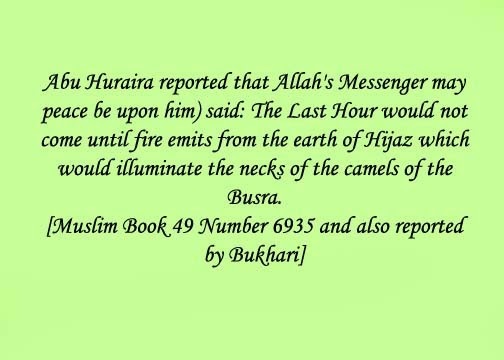 Hadith indicates that there will be massive fire in Hijaz which is in Saudi Arabia. The sign has already occurred during the time of Abu Shama a Muslim historian. This sign occurred as described by the Prophet. The emergence of this fire took place near the mosque of the Prophet at Madina in the year 654 AH and has been truthfully reported by trustworthy sources to have taken place just as the Messenger of Allah had informed. 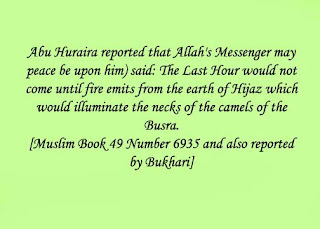 It happened 640 years after Muhammad PBUH prophesy. Imam Al Nawawi also report the incident as being a truthful and thus a fulfilled one.